Three Canadians were vying for a spot in the singles quarter-finals on Thursday at the Saguenay National Bank Challenger. Katherine Sebov (Toronto, ON) was the first Canadian to take to the court on Thursday as she was taking on American qualifier Kennedy Shaffer. After grinding out a tight first round match on Tuesday, Sebov was looking to get off to a better start. The Toronto native raced off to an early lead, maintaining a consistent level of play while her opponent committed a number of critical errors. She took the opening set and continued her momentum into the second, ultimately taking the match after an hour and a half of play. She booked her spot in the quarter-finals with a 6-2, 6-2 victory. Her compatriot Bianca Andreescu (Mississauga, ON) was also looking to earn a place in the quarter-finals. Standing in her way was American Hayley Carter, who had to pass through the qualifications to reach the main draw. 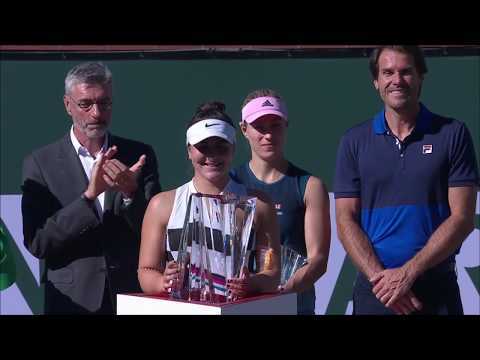 Andreescu, the tournament’s seventh seed, was hoping to better her performance from last year, having been eliminated in the first round. The Canadian experienced some struggles while on serve, but compensated with some heavy baseline hitting throughout the match. She needed just under two hours to grind out a 7-5, 7-5 victory, moving into the quarter-finals. The final Canadian hoping to move on in the tournament was the 17-year-old Alexandra Vagramov (Port Moody, BC). Playing in only her thirteenth professional tournament, the young Vagramov caused the upset in her opening round match, defeating a player ranked over 600 spots higher than her. She had the tough task of facing the top seed Kateryna Koslova of Ukraine. Despite falling 6-2, 6-0 to her opponent, Vagramov is walking away from the tournament having gained some valuable experience. In doubles, Sharon Fichman (Toronto, ON) is back on the tour for the first time since 2016. Playing alongside Maria Sanchez of the United States, she is taking part in only her fifth tournament of the year. The duo booked their spot in the doubles final with a 7-5, 7-6 (11) victory. The final match of the day saw the all-Canadian team of Carson Branstine (Orange, CA) and Andreescu taking on Sebov and her partner Elitsa Kostova of Bulgaria. Sebov and Kostova walked away with a 6-2, 6-7(5), 10-4 victory. The tournament’s second seed Conny Perrin of Switzerland and sixth seed Jessika Ponchet of France both moved on to the quarter-finals, with 4-6, 7-5, 6-2 and 6-2, 3-6, 6-3 victories, respectively.